From the back cover: "Amir is the son of a wealthy Kabul merchant, a member of the ruling caste of Pashtuns. Hassan, his servant and constant companion, is a Hazara, a despised and impoverished caste. 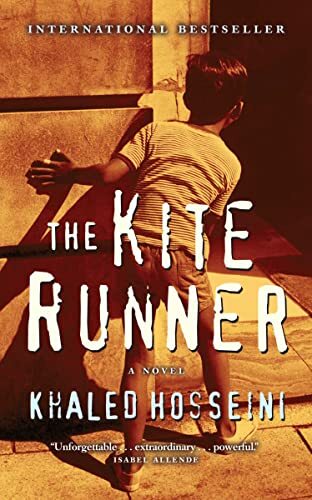 Their uncommon bond is torn by Amir's choice to abandon his friend amidst the increasing ethnic, religious, and political tensions of the dying years of the Afghan monarchy, and apparently disolved when Amir and his father flee to California to escape the Soviet invasion, leaving Hassan and his own gentle father to a terrible fate. But years later, an old family friend calls Amir from Pakistan and reminds him: "There is a way to be good again." and Amir journeys back to a distant world, to try to right past wrongs against the only true friend he ever had." This was a great story! It's the third novel I've read about Afganistan and I certainly know that it is not a place I want to visit. This novel describes a country whose people have experienced so much fear, so much horror and sadness, a place where secrets abound. It once again portrays how people's everyday lives are so affected by the politics and economics of their country. Without giving too much away, it is interesting so see where hope exists and how it is expressed. RELEASE NOTES: Instead of going into Giz-angel's bookbox as was previously stated,this journal has been edited - this book is now being sent as a RABCK to zosime. Thank you so much! I can't wait to read this, one of my friends read it last month and she cannot stop going on about it.